A short biography of the legendary Mexican revolutionary hero, guerrilla and anarchist, Emiliano Zapata. 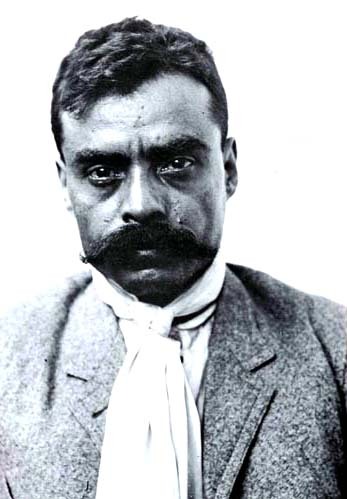 Emiliano Zapata (August 8 1879 – April 9 1919) was a leading figure in the Mexican Revolution of 1910 against the dictatorship of Porfirio Díaz. He is considered to be one of the national heroes of Mexico; the Zapatistas, a revolutionary movement based in the state of Chiapas, take their name from him. Zapata was born in the small central Mexican state of Morelos in the village of Anenecuilco. At the time Mexico was ruled by a dictatorship under Díaz, who had seized power in 1876. The social system of the time was a sort of proto-capitalist feudal system, with large landed estates (haciendas) controlling more and more of the land and squeezing it away from independent communities of Indians (pueblos), who were then subsequently forced into debt slavery (peonage) on the haciendas. Díaz ran local elections to pacify the peones and run a government that they could argue was self-imposed. Under Díaz close confidants and associates were given offices in districts throughout Mexico. These offices became the enforcers of land reforms that concentrated the haciendas into fewer hands. Zapata's family, although not enormously wealthy, still retained independence. They were never in danger of poverty, avoiding peonage and maintaining their own land (ranchero). In fact the family had in previous generations been porfirista, that is, supporters of Díaz. Zapata himself always had a reputation for being a fancy dresser, appearing at bullfights and rodeos in his elaborate charro (cowboy) costume. Though his flashiness would usually have associated him with the rich hacendados who controlled the lands, he seems to have retained the admiration and even adoration of the people of his village, Anenecuilco, so that by the time he was 30 he was the chief of the village. Though he was not of pure indigenous blood (he had some Spanish ancestry and was considered mestizo), Zapata quickly became involved in struggles for the rights of the Indians of Morelos. He observed numerous conflicts between villagers and hacendados over the constant theft of village land, and in one terrible instance saw the hacendados torch an entire village. For many years he campaigned steadily for the rights of the villagers, first establishing via ancient title deeds the claims of the villagers to disputed land, and then pressing the recalcitrant governor of Morelos into action. Finally, disgusted with the slow response from the government and the overt bias towards the wealthy plantation owners, Zapata began making use of armed force, simply taking over the land in dispute. At this time, Porfirio Díaz was being threatened by the candidacy of Francisco I. Madero. Zapata made quiet alliances with Madero, who at the time was perceived as a chance for genuine change in Mexico. In 1910, unrest finally broke out in the formation of guerrilla bands. Zapata quickly took an important role, becoming the general of an army that formed in Morelos (the Ejercito Libertador del Sur – Liberation Army of the South). Zapata was partly influenced by an anarchist from Northern Mexico named Ricardo Flores Magón. The influence of Magón on Zapata can be seen in the Zapatismo Plan de Ayala, but even more noticably in the Zapatista slogan "Tierra y libertad" or "land and liberty," the title and maxim of Magón's most famous work. Zapata's introduction to anarchism came via a local schoolteacher, Otilio Montano, who exposed Zapata to the works of Peter Kropotkin and Flores Magón at the same time as Zapata was observing and beginning to participate in the struggles of the peasants for the land. Díaz was overthrown by Madero, largely due to widespread rebellions by the peones. Under Madero, some new land reforms were carried out and elections were to be ensured. However, Zapata was dissatisfied with Madero's stance on land reform, and was unable, despite repeated efforts, to make Madero understand the importance of the issue or to get him to act on it and support the Plan de Ayala. Finally, after Madero's appointment of a governor who supported the plantation owners and his lack of motion towards settling the land issue to Zapata's satisfaction, Emiliano mobilised the Liberation Army again. Madero was soon thereafter overthrown by Victoriano Huerta, a former porfirista general, who gave amnesty to Díaz and suppressed indigenous resistance to land reforms. The peasant reaction to this increased the size of Zapata's forces considerably, and also gave rise to a new group in the north: the Villistas under Pancho Villa. The Villistas were mainly composed of Madero supporters. Zapata at first was hesitant to meet with Villa, after Villa vehemently rejected the Plan de Ayala when a Zapatista introduced him to the concept in prison. Opposition to Huerta coalesced under Venustiano Carranza, who led a Constitutionalist faction which both Villa and Zapata eventually allied with. These forces proved too much for Huerta to match, and he was quickly deposed. Following his defeat, the Constitutionalists set up a convention to decide the form of the government. Zapata refused to attend the convention, pointing out that none of the attendees had been elected. Instead the chiefs in Morelos sent a delegation to present the Plan de Ayala for consideration and observe the state of the convention. Soon thereafter Carranza had himself made head of the government, which sparked further outrage. Initially Carranza commanded the loyalty of Álvaro Obregón, who suppressed the Villista guerrillas. The Zapatistas, however, remained mobilized, but grew increasingly fractured after many long years of campaigning. On April 9, 1919, a General Guajardo invited Zapata for a meeting, pretending to be friendly towards him. When Zapata arrived, Guajardo riddled him with bullets and turned his body in for the bounty (getting half of what was originally promised). Following Zapata's death, the Liberation Army of the South slowly fell apart, eventually disappearing after Obregón's rebellion deposed Carranza. Zapata's influence, however, is visible today, particularly in revolutionary tendencies in south Mexico. Zapata has been represented in the movies by Marlon Brando (1952), Jaime Fernández (1966), Tony Davis, (1969), Antonio Aguilar (1970), and Alejandro Fernández (2002 – in Nahuatl language)). Calling him an anarchist is a bit of a stretch. He was definitely cool tho. Zapata was more an anarchist than Villa, if such a comparison is necessary.